In the world of Web video, either you are YouTube or you are in trouble. Today, well-funded video site Veoh laid off 25 people, the company confirmed today. The layoffs were brought on by a restructuring, as the company shifts focus away from its standalone site, says founder and now-reinstated CEO Dmitry Shapiro. Shapiro replaces former CEO Steve Mitgang. With both today’s layoffs and cutbacks last November, the company is now left with 45 employees, says Shapiro. We have added the latest round to our Layoff Tracker. Shapiro says that the company is doubling down on its video search browser plug-in, Video Compass, in an effort to engage consumers with videos at times when they wouldn’t normally be watching them. Video Compass adds a video recommendations whenever you conduct a search on Google or elsewhere on the Web. Veoh adds over 25,000 new Video Compass users daily. Veoh’s standalone video playing site is having difficulty competing with the bigger players in the game like YouTube and Hulu. Still Shapiro maintains that Veoh’s site remains popular among consumers, generating more than 200 million video streams each month from content publishers such as ABC, CBS, ESPN, Viacom, and Warner Bros. Comscore says Veoh’s site had 15 million unique views worldwide in February 2009, down from 18 million last August, plus another 7.2 million for its VeohTV app, which has also been losing viewers (see chart below). Shapiro says that the site alone reaches over 23 million unique users each month. So what went wrong? Shapiro says that the video search business model is still immature. He thinks that while video should be omnipresent in a consumer’s web experience, the ad model is still evolving. Shapiro is sure that advertisers will one day throw seven and eight-figure dollar amounts to advertise on video sites, but its simply not there yet. For that reason, Veoh is tightening its belt and trying to come up with new ways get consumers to watch videos. But getting people to watch videos online doesn’t seem to be the problem. It is getting advertisers to pay to reach those viewers. Veoh is placing a big bet on Video Compass, which is a novel video discovery tool, but still has many glitches to work out. As we wrote in our review, Video Compass sometimes offers bizarre matches and appears only after the page you’re visiting has finished loading (so your Google search will finish, for instance, and only then will the Veoh ribbon pop in, shifting everything down a few centimeters). Veoh has been on a rollercoaster ride over the past year. It is currently embroiled in a lawsuit with Universal Music Group, which so far seems to be going its way, marginally. Veoh has also raised significant capital ($70 million to be exact) from big-name investors like Goldman Sachs, Gordon Crawford and Time Warner. Shapiro says investors are supportive of the company’s redirection so far. 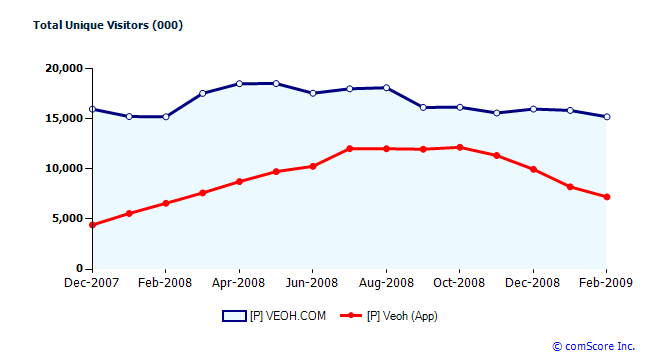 The two comScore charts below show worldwide unique visitors (for both Veoh’s site and its VeohTV app), and a U.S. comparison of Veoh.com to Hulu,.com.